Create a new email via creative and email. 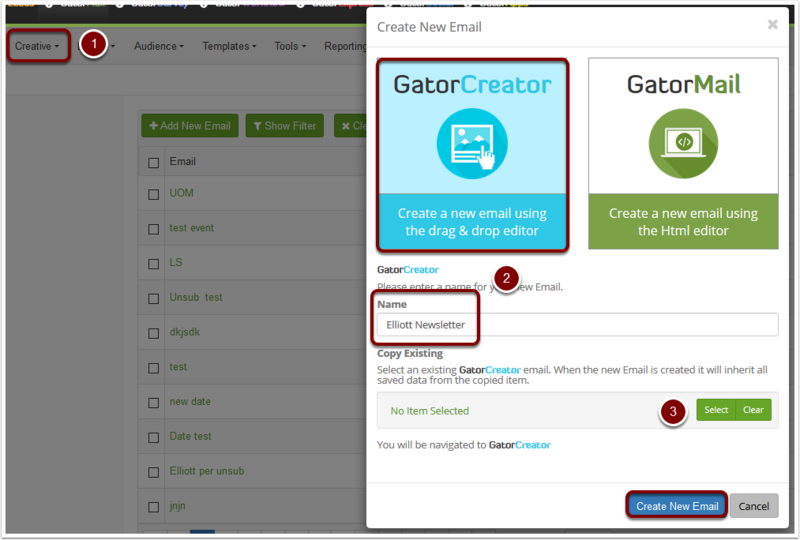 Click add new email and select GatorCreator, provide your name followed by newsletter. Select the top container block. Remove the View in Web Browser & Forward to a Friend Link. Insert the View in Web Browser Link. Insert the Forward to a Friend Link. 5. Select the banner image. 6. Click 'Select Image' and upload a new image of your choosing and insert. 7. Create a link to a web page of your choosing. 8. Provide a link description. 13. Add a web address of your choosing. 14. Add a link description. 15. Select the title text and change to download the guide. 17. Select one of the documents from the reference folder and click insert. 18. Highlight the text 'The International Development Team'. 19. Insert a 'Landing Zone' with the reference of 1. 2. Select 'COPY HTML EMAIL'. 3. Click on the cross (close), on the top right of the editor, then click save and close.